Even small amounts of humidity can change the attributes of sensitive materials. October’s e-calendar offer from METTLER TOLEDO will help users learn to ensure reliable halogen moisture analyzer results through an easy, 10-minute routine test. Ensure accurate moisture analysis with this month’s e-Calendar entry. In just ten minutes, SmartCal monitors a moisture analyzer’s performance and assesses the proper functioning of both the heating element and internal balance mechanism. For substances such as foodstuffs, chemicals and plastics, moisture is a critical quality determinant. 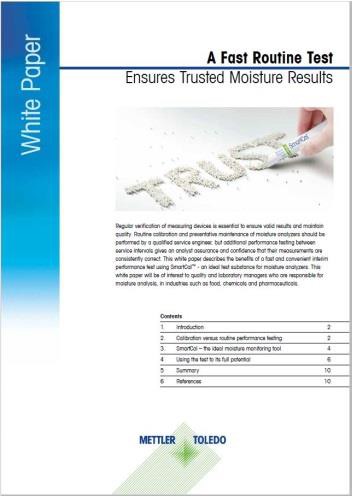 Making accuracy in this important test even more critical, moisture content levels are often set by regulatory standards to ensure consumers get what they pay for. 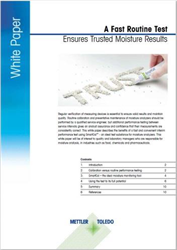 Fortunately, as described in a new, free white paper from METTLER TOLEDO, ensuring a halogen moisture analyzer is generating accurate results has never been easier. “A Fast Routine Test Ensures Trusted Moisture Results” explains the benefits of routine testing using SmartCal, a highly accurate yet easy-to-handle test substance. In just ten minutes, SmartCal monitors a moisture analyzer’s performance and assesses the proper functioning of both the heating element and internal balance mechanism. Periodic assurance can help prevent tedious rework, loss of expensive production batches, and even fees or fines. Explore how easy it can be to determine whether or not a moisture analyzer is on target by downloading “A Fast Routine Test” free throughout the month of October. The download is part of the lab-equipment leader’s year-long e-Calendar. Keep watching for 2017’s remaining installments to discover additional ideas for optimizing lab processes and improving accuracy.